The following article is taken from the Disability News Service website and was written by John Pring. I am taking no credit for the writing of this article and urge readers to visit the Disability News Service website. You can do so by clicking here. Disabled campaigners have welcomed measures that aim to address concerns over the imminent closure of the Welsh government’s independent living grant scheme. Julie Morgan, the deputy minister for health and social services, has written to council leaders to ask for an immediate “pause” in the closure programme and its replacement with a system of council-funded support. There will now be new independent assessments for any former recipients of the Welsh Independent Living Grant (WILG) scheme who are unhappy with the new support packages allocated by their local authority. The new measures came just two weeks after Nathan Lee Davies (pictured), who has led the campaign to save the WILG scheme, sent an 80-page dossier of evidence about the closure to Welsh Labour’s new leader and first minister, Mark Drakeford. Davies told Drakeford in an open letter accompanying the dossier that closing WILG would leave disabled people with high support needs, like him, “at the mercy of cash-strapped Local Authorities who seem intent on cutting vital support packages across the board with no guarantee that further cuts will not follow”. He sent his letter with just two months to go until the interim WILG scheme was due to close. Now Morgan has announced a pause in the transition to the new system. WILG was set up – with UK government funding – as an interim scheme following the UK government’s decision to close the Independent Living Fund in June 2015. The Welsh government is now closing WILG for good and transferring the funding to local councils, and by April the 22 local authorities were due to be solely responsible for meeting the support needs of all former ILF-recipients in Wales. But in a written statement to assembly members, Morgan said she had considered the evidence and decided there needed to be a “change in direction” because her government’s own review had shown a significant variation in how support packages were being cut by different councils. Morgan said that all WILG recipients who were unhappy with their new care and support package and would like a second opinion would now be offered an independent assessment. These assessments will be funded by the Welsh government, which will also pay for any resulting additional hours of support. The government said that the new assessments would “acknowledge the historical entitlement of former ILF recipients”, while Morgan told assembly members in a written statement that there would be “no financial barrier [so]no-one need have less favourable care and support than they had under ILF”. Morgan, who praised Davies and his fellow campaigners, said: “It is paramount that people’s ability to live independently is not compromised by changes to the care and support provided for people previously in receipt of the Welsh Independent Living Grant. “These changes will ensure that is the case and deliver a consistent level of care and support across Wales. “While the majority of former ILF recipients are receiving the same or more care as they were previously, a significant number have experienced a reduction in hours of support. “There is also considerable variation in the reductions in support. “I have therefore written to local government leaders to request a pause of the transition with immediate effect in order to bring in the revised arrangements. Davies, who was celebrating his birthday on the day of the announcement, said it was “the perfect 42nd birthday gift”. He added: “It is a pleasure to be working with our new first minister Mark Drakeford and his revamped cabinet that differs substantially from the previous regime. “Welsh Labour have now successfully re-branded themselves and are moving forward with a clear vision of creating a society based on 21st century socialist ideas. “There is still some work to be done with Welsh Labour on the new arrangements to support disabled people to live independently. “I am confident that this work will be carried out constructively and add to the ‘clear red water’ that Welsh Labour are once again setting between themselves and Westminster. Government ministers are failing to uphold the rights of disabled people, ignoring the need to engage with disabled people’s organisations, and do not understand the UN’s disability convention, according to a new report. The highly-critical report has been compiled by disabled people’s organisations (DPOs) across the UK and submitted to the UN’s committee on the rights of persons with disabilities. It analyses how the UK and devolved governments have responded to key parts of last year’s highly-critical report by the committee on the UK’s progress in implementing the UN Convention on the Rights of Persons with Disabilities (UNCRPD). The new report includes some criticism of the devolved governments of Scotland and Wales – and raises concerns about the impact of the continuing political impasse over the Northern Ireland Executive – but most of its concerns are directed at the UK government in Westminster. The UK government, the report says, is responsible for “continuing retrogression and re-institutionalisation” of disabled people and continues to disagree with the UN committee’s findings and recommendations. It provides the example of international development secretary Penny Mordaunt, who appeared to try to redefine the meaning of inclusive education at the government’s Global Disability Summit in July, telling the international audience that inclusive education meant “that everyone has an education and it is done in a way to reach their full potential”. The report says that many of the concerns raised by DPOs last year in their evidence to the UN committee remained a “significant problem”, with disabled people still subject to “tightening eligibility” for support, the removal and sanctioning of benefits and the bedroom tax. It also raises concerns about the continuing rollout of universal credit (UC) and says DPOs are “gravely concerned” at the failure to assess the access needs of disabled people due to be moved onto UC and the lack of the necessary data to monitor its impact. It warns that the social care funding crisis has led to the removal of further essential independent living support for disabled people and the closure of community services for people with mental distress, while increasing social care charges are leaving thousands of disabled people in debt or choosing to pull out of receiving support completely. The DPOs also point to the chronic shortage of accessible housing in England, with new housing for disabled people often limited to segregated supported housing complexes. And the report says that the number of disabled children being forced into special schools is rising, while budget cuts are reducing the quality of inclusive education, and the number of disabled pupils left without any educational placement at all has risen, as has the number of disabled pupils excluded from school. Among the DPOs that contributed to the report are the Alliance for Inclusive Education, Disability Action (Northern Ireland), Disabled People Against Cuts, Disability Wales, Inclusion London, Inclusion Scotland, the Reclaiming Our Futures Alliance and Sisters of Frida. They make 22 recommendations of their own that are aimed at the UK government, including calling for: a new legal right to independent living; the abolition of charging for social care; an end to the practice of placing disabled children and young people in long-stay hospitals; and a new social security system that is based on “an accurate analysis of need” and is “consistent with a human rights approach to disability”. There are also four recommendations for the Welsh government – including a call to incorporate the UNCRPD into Welsh law – and six for the Scottish government, including the need for a national strategy on the provision of accessible housing. The DPOs conclude that examples of “progressive” policy-making have been restricted to the devolved governments of Scotland and Wales, although the two executives are “not without room for improvement” themselves. There is also repeated criticism in the report of the UK government’s “inadequate engagement” with DPOs and its failure to recognise the importance of consulting disabled people. The report says that “engagement with non-user-led charities is continuously prioritised over engagement with DPOs”, while requests by DPOs to meet ministers “are frequently turned down”. It also says that engagement with the UK government is “undermined by an increasing lack of trust”, and warns that “without trust, consultation and engagement cannot take place in ‘good faith’”. The report does welcome one measure taken by the UK government, the increased funding for disabled facilities grants, although it warns that “delays in processing applications can still be a problem for under-resourced local authorities”. This week’s report follows the publication of the government’s own progress report last month. The DPO report is highly critical of the government’s progress report, accusing it of effectively ignoring many of the UN committee’s recommendations. One of the recommendations ignored, it says, was to carry out a cumulative impact assessment (CIA) of its cuts and reforms on disabled people, with the UK government continuing to insist that this is not possible. It points out that the Equality and Human Rights Commission (EHRC) published a CIA earlier this year, while the Greater London Assembly is conducting its own CIA for London “using the same methodology as the EHRC”, and both the Scottish and Welsh governments are “exploring carrying out their own”. There is also frustration at the government’s failure to follow up the UN committee’s recommendation that it should devise a “comprehensive” plan aimed at the “deinstitutionalisation” of disabled people, in “close collaboration” with DPOs. It was a scorching hot day in London and my comrades Delyth Lloyd-Williams and Greg Ogden reckon I was on fire too as we continue our fight to #SaveWILG. I would love to write more but time is at a premium and I must keep on campaigning. I just have time to say that we spoke with Chris Ruane MP and John McDonnell MP as we aim to #SaveWILG. I am requesting help on Twitter to spread awareness of our #SaveWILG campaign during Thursday evening’s Question Time, which is taking place in Caernarfon. We have fellow campaigners in the audience to ask questions, though we recognise that it is very unlikely that any question on the future of WILG will be aired on the BBC. If you are busy on Thursday evening, don’t worry. You can also get the message across to Assembly Members throughout Wales at any time. We must make it clear that there is still time to reverse the awful decision to close WILG and transfer all responsibilities for Independent Living to local authorities. A list of AM Twitter handles can be found below along with a suggested Tweet and electronic postcards and memes that can be attached to Tweets for greater impact. Even if you only manage to Tweet a handful of AMs, this could make a real difference to disabled people across Wales. You should also look out for some BRAND NEW MEMES that will be coming your way very soon. Please be advised that these Tweets should be modified and adapted slightly to prevent Twitter from assuming they are spam messages. To help prevent this, the Tweets can also be individualised by using some of the many postcard photographs, electronic postcards and memes. Yesterday I received an email from Ian Lucas MP who shared the response to his letter to Rebecca Evans AM about my WILG campaign. His letter can be read here. The response he received can be read below and it is most disappointing. Instead of being disheartened by this response, it has given me and my comrades extra impetus for the fight ahead. There are so many points that Evans has made here that are just quite simply unfair and discriminatory. It is time to ramp up the pressure on Evans and her cronies in Cardiff. We can not stand by and let this happen in 21st century Britain. I am overwhelmed with the support I am getting from the north Wales public and this is really appreciated as it gives me the strength to carry on with the fight for all WILG recipients – the majority of who I are not even aware that this fight is going on. I could write pages in response to this letter, but I do not have the time at the moment. My time is better spent on the struggle to achieve liberty and justice for the disabled community. Thank you for your letter on behalf of your constituent, Nathan Lee Davies regarding the decision to provide support in future to former recipients of the Independent Living Fund (ILF) through local authorities’ social care. Following the closure of the ILF in 2015 by the UK Government, we put in place interim arrangements with local authorities to ensure continuity of support for former recipients in Wales through our Welsh Independent Living Grant (WILG). This has worked well and I understand Mr Davies has been receiving payments from Wrexham County Borough Council under this to continue to help him meet the costs of living independently. These arrangements were put in place while we considered how support in the longer term should be provided. To assist with that consideration a stakeholder advisory group was established. This had representation from the organisations which represent and act for disabled people in Wales (such as Disability Wales and the Dewis Centre for Independent Living), representation from local authorities and some recipients themselves. The advisory group considered a number of potential options to provide future support. These ranged from perpetuating the WILG indefinitely or for a set period of time, to establishing similar arrangements in Wales to that of the ILF outside of local authorities’ provision. 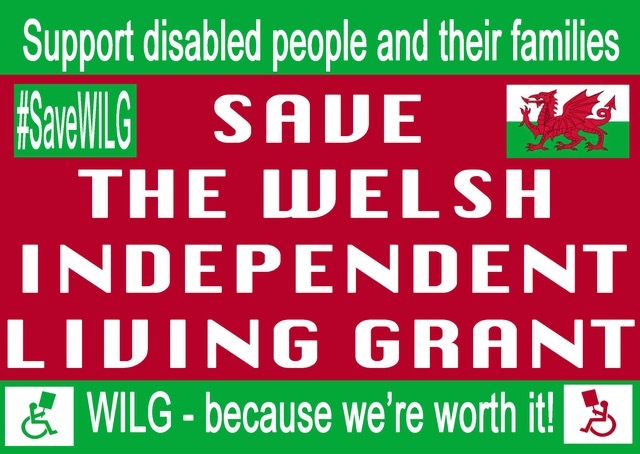 The advisory group considered the advantages and disadvantages of each option in terms of its effectiveness to support former recipients and its fit with supporting the larger group of disabled people in Wales who had been excluded by the UK Government from receiving support from the ILF following its closure to new entrants in 2010. In light of these issues the advisory group on balance favoured the option of future support being provided by local authorities as part of their social care provision. It did so because this option matched the future support former recipients would receive with that being provided generally to disabled and older people in Wales. This is in keeping with our person-centred ethos for social care being delivered through the Social Services and Well-being (Wales) Act 2014. This is similar to the ethos behind the original establishment of the ILF. The advisory group also saw this option as the way forward as it removed the inequitable two-tier approach which currently exists to supporting disabled people in Wales, with some receiving only support from their local authority while others can receive this as well as dedicated payments from the WILG. I accepted the stakeholder advisory group’s advice in full. I appreciate that Mr Davies and others who wished to see a different option chosen will be disappointed with the decision taken and will be apprehensive about the future. However, to ensure a smooth transition in recipients’ support, all local authorities were issued with detailed guidance. This covered how authorities were to prepare and undertake the care assessments necessary to identify what recipients need to continue to live independently. It also covered the resultant agreement of the future care package a person required and provided clear advice that a person’s payments under the WILG should not cease until that care package was in place. As part of our monitoring of local authorities’ preparations for this transition, all authorities have recently confirmed that they have plans in place to implement this change, with the majority having commenced their care assessments. In a small number of cases recipients have already had these, agreed a future care package and have transferred to receiving their support from their local authority. Most authorities are, therefore, confident of completing the care assessments they need to undertake in 2017-18. In the case of Wrexham I understand it has a plan in place to implement this change and that care assessments have begun. I am aware, however, that completion of this to time is dependent on the authority creating additional social worker capacity. I understand the authority has secured funding but has yet to fill vacancies. In view of this, officials are maintaining a watching brief on the situation.